To celebrate Real Nappy Week (28 April – 4 May) Down District Council is joining forces with Cloth Nappy Library NI to show you all that real nappies are real easy. New styled nappies are making an impact on parents with infants and young children. Gone are the days when a ‘cloth nappy’ meant a white terry towelling nappy being boiled in an aluminium bucket. No wonder many mums switched to the disposable type of nappy! But now, many are switching back thanks to a fantastic new range of materials and fabrics for cloth nappies and an easier way of using them. 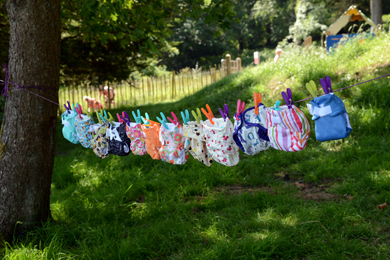 In addition to the fact that they are a healthier, free-from-chemicals alternative to the disposable nappy, cloth nappies are also great for the environment particularly when you consider that it takes an estimated 250-500 years for one disposable nappy to decompose. With savings in excess of £700 per child, they’re also great for your purse. With so many styles and types available, however, it’s easy to see how parents can be confused about what’s on offer so together with the multi award winning Cloth Nappy Library NI, Down District Council is supporting their initiative for Down district residents to try before you buy. In an effort to reduce waste going to landfill Down District Council have a limited number of subsidies available to assist getting started. The council will match fund what you spend on hiring a real nappy kit from Cloth Nappy Library or on purchasing cloth nappies up to £30. (This offer is limited and issued on a first come first served basis). The trail kit has a range of nappies, accessorises and boosters needed so you can try before you buy! Please contact Cloth Nappy Library to book your kit and further information. For further information contact Down District Council’s Environmental Services department on 028 4461 0800.